Condo, 3 Bedrooms , 3 Baths, (Sleeps 10), Dog under 20 lbs okay. Emerald Green Waters, White Sands, Tropical Breezes and Spectacular Sunsets, What are you waiting for? Bonita Beach Unit 17 is located at 17921 Front Beach Rd, Panama City Beach, FL 32413. Bonita Beach Condo #17 on the second floor offers you a relaxing beach atmosphere. The unit is well appointed to make your stay comfortable on the Worlds Most Beautiful Beaches. The Master Bedroom offers a KING sized bed, Flat-screen T.V., DVD player, ceiling fan, chair and a dresser. The Master Bath offers a large walk in shower, double vanity, and walk in closet. The second Master Bedroom offers a KING sized bed, T.V., dresser, ceiling fan, and a private full bath. The third Bedroom offers Two Queen sized beds, T.V., ceiling fan, chair, and a dresser. There is a full guest bath just outside the third bedroom. The living area consists of a spacious fully equipped kitchen, dining room, and living room that overlook the balcony and beaches. The living room offers a sofa with sleeper, a love seat, two occasional chairs chairs, ottoman, a 32 inch Flat Screen LCD T.V. and DVD player. The flooring throughout is tiled in a textured neutral tile. The beaches are just steps from the large balcony. Two beach chairs with ottoman, two bar height chairs & table. The pool is conveniently located near the unit. Parking and guest parking is located directly in front of the unit. 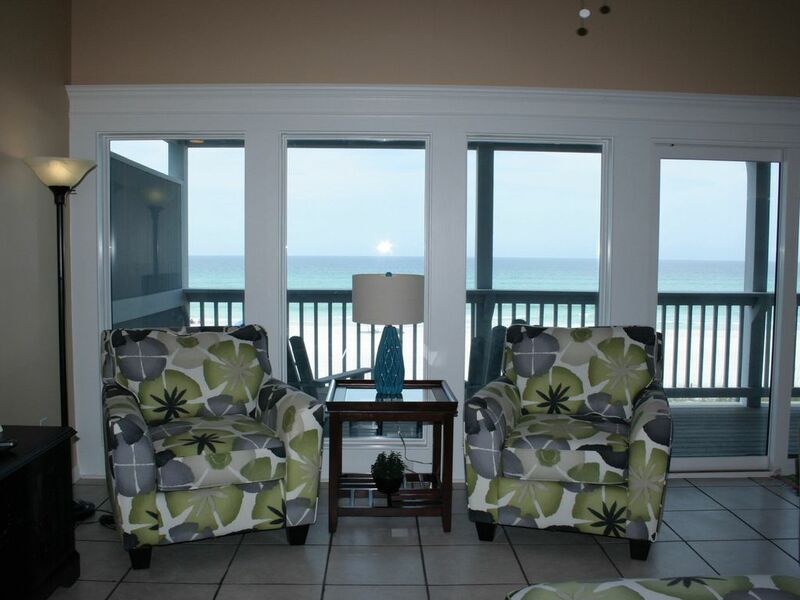 Bonita Beach Condo is on the Gulf of Mexico at 17921 Front Beach Road, Panama City Beach, FL 32413. Approximately 2 miles West of Hwy 79 at Front Beach Road. Bonita Beach consists of 20 units. 10 first floor units, 1-10 and 10 second floor units, 11-20. P.S. Don't forget your pet is also welcome in units 7 and 17. Dog only, weighing 20 lbs or less, current on shots, flea, tick and worm preventative treatments. Pet must be pre-approved at time of reservation. Public beaches are not pet friendly. Pet is not allowed on beds, furniture, or bedding. More units available. Please check my other rental units by selecting the link under the main photo, Manager Info, then, click on view all my rentals. VRBO numbers 184213, 301093, 498265, 423705, 220458, 259515, 446457, 372128, 479545, 220445, 409643, 570989, 501053, 623935, 686053, 231326, 1185028 and 268671.
toilet, shower, Upgraded master bathroom with tuscan flair. toilet, combination tub/shower, Full bath with tub/shower combination, toilet and vanity. Each bathroom is a full three piece bathroom with tub/shower combination, vanity and toilet. Dedicated parking directly in front of unit. Guest parking on a first come basis. Comcast Broadband Wireless Internet password protected. Built in overhead of stove/oven. Spacious kitchen with island open to dining room, living room and has views of the beach. TV's in living room and each bedroom. (4) LCD Flat Screen in living room, LCD Flat Screen in Master bedroom, tv's in guest bedrooms. Balcony expands the width of the unit with stairs leading down to the beach. Deck chairs on deck to relax in and enjoy the beach atmosphere. Pool is located Infront of units 5 and 6 in the third building. The pool is two units away from #17. Very quiet. Pier Park is only 2.3 miles East of Bonita Beach. Winn Dixie and Publix are just minutes away. Condo is located at Laguna Beach. The airport code ECP is 20-30 minutes away. Frank Brown park is just minutes away. Hwy 79 is 2 miles to the East. Love this condo! Best view anywhere! This unit is very nicely decorated and very clean. The bedrooms are all well appointed and the kitchen is well stocked for those who want to do a bit of cooking. The view of the Gulf is amazing, and the beach/water is only steps away. Our small group is already planning to return in 2019. This will be our new place! We have been searching for awhile to find a beach vacation spot that encompasses everything that is important to us - and this is it! We have finally found our “spot”. The location is perfect - not too close to the “craziness” that comes with PCB , but only a few minutes drive to get to it all , if that’s what you want. The convenience of being able to simply walk out to the beach was second to none , and the unit itself was incredibly comfortable and up to date. We will ABSOLUTELY be back! We enjoyed our 3 day weekend at this beach condo. It was very clean and furnished with everything we needed and more. We would highly recommend this beautiful beach condo. The view was absolutely amazing. Thank you. I have stayed at this condo 3 times now and for my family it is perfect. My kids are grown with families so everyone has their own bedroom and full bath. Very clean with everything you need, full kitchens if you want to cook. It is directly on the beach with a private door from your condo straight to the beach. If you need to relax, build sand castles, play in the water or just spend time with family its perfect. There are water parks, excellent dining/fast food, and fun inside things if its raining. On a scale of 1-10 I give this condo an 11. David is easy to work with and helpful. Thank you for another wonderful beach vacation!! The best family vacation yet! This rental was a fully functioning home, beautiful indoor and outdoor living and a real treat for my family. We loved the proximity to the beach and the Bonita Beach community. We even saw dolphins from our balcony. There were no concerns of crowded beaches or noisy neighbors. We are looking forward to coming back for another relaxing family vacation! Conveniently located 2.3 miles West of Pier Park, Frank Brown Park, Seaside, Rosemary Beach, Destin, Silver Sands Outlet Mall, and Golf Courses. New international airport within 30 minutes. Bonita Beach Condo is located 2 miles West of Hwy 79 at Laguna Beach. 1/2 of balance due at reservation Remaining of balance due 30 days prior to arrival Payment in full due at booking if less than 30 days prior to arrival. All VRBO online payments will incur an Admin fee of 3% added at time of booking. All international credit cards will incur a 5% Admin Fee added at time of booking. Pets: Small dog only must be under 20 lbs, current on shots, flea, tick and worm treatments. No Cats due to allergies. Pet must be pre-approved prior to reserving the unit. Rates vary from $1,800.00 off Season to $3,200.00 in Season per week rent + $170.00 cleaning fee + $400.00 refundable damage deposit + 13.12% sales tax. Please inquire about exact rates for a particular week. PETS: Only small dogs will be considered, must weigh under 20 lbs, be current on shots, flea, tick and worm treatments. Public beaches are not pet friendly. Bonita Beach is a smoke free resort. No smoking is allowed. Please include number of adults age 18 and older and the number of children age 0-17 years. MORE BONITA BEACH UNITS AVAILABLE AND UNITS NEXT DOOR AT BEACH SIDE WEST. See VRBO ID’s 301093, 498265, 570989, 686053, 790649, 790650, 623935 and 875889.